The Enterprise-B is commissioned, but the maiden voyage becomes a rescue mission when two ships with El-Aurian refugees are about to be crushed in an energy ribbon. In the course of this mission Captain Kirk is apparently killed when he works on a deflector modification and vanishes through a hull breach. 78 years later: The Enterprise-D investigates an attack on the Amargosa research outpost and barely escapes the explosion of the Amargosa central star. The El-Aurian Soran, with help from the renegade Klingons Lursa and B'etor, is responsible for the destruction of whole solar systems. His intention is to return into the Nexus, the energy ribbon moving through the galaxy that he once experienced 78 years ago. In his effort to stop him and save the Veridian system, Picard seeks help from Kirk, who has actually spent the last 78 years inside the Nexus. They succeed, but Kirk loses his life, and after a skirmish with the Klingons the Enterprise-D saucer crashes on Veridian III. Although Scotty, Chekov and most notably Captain Kirk appear in it, "Star Trek Generations" is the first TNG movie, and its emphasis is on the 24th century, with Kirk being only a guest star. The basic idea of Soran seeking a way back into the Nexus, thereby creating a connection between Kirk's and Picard's destinies, is intriguing. 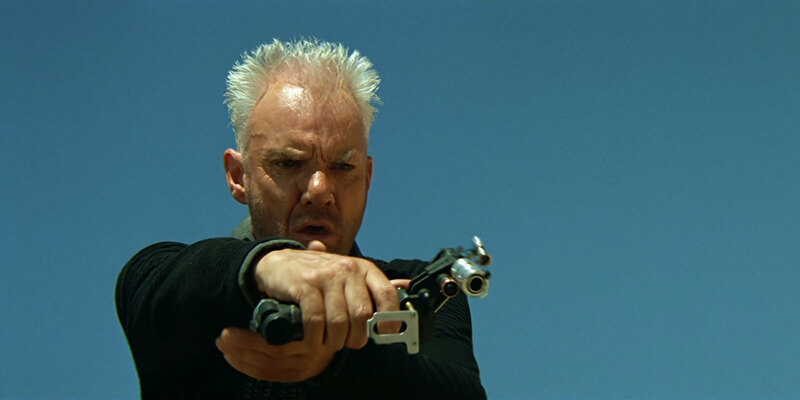 Soran as a character is convincing in that he is rather unscrupulous than really bad or mad. He does not seek profit or power but just wants to achieve happiness, something we unfortunately don't get to see in other Trek movie villains. There are, however, several logical flaws regarding the Nexus that are not resolved or made plausible in any fashion. Even if this omnipotent domain is accepted as such, its effects including a parallel space/reality and space/time travel are too numerous for a movie plot that always needs limited options to remain credible. One of the key questions is why Picard and Kirk return to a place and time where Soran is already about to push the button. Much like Genesis in ST:TWOK the Nexus can accomplish just too much to be useful as a plot device, and it poses more questions than it can possibly answer. Unfortunately, except for Picard and Data no one of the Enterprise-D crew speaks more than a few lines, unlike in TNG where the characters were almost equally important in the final seasons. Not even Riker contributes more than occasional lines to the story, quite unlike it was the usual case in TNG. I think several TNG episodes had far better plots anyway, and not even the higher movie budget and the big screen make "Generations" a more exciting experience than "All Good Things", for instance. The dialogues in "Generations" are better than in the five previous movies. I don't want to detract from Nimoy's, and Shatner's or Meyer's style of making movies, but I am glad to see that the new, less declamatory, less military and overall brighter atmosphere was salvaged from TNG, rather than carrying on with the Trek movie tradition. 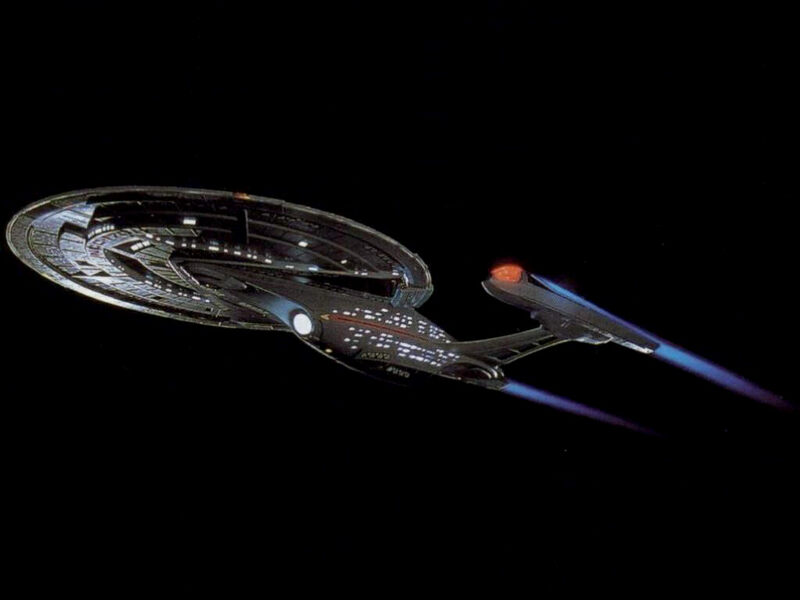 Well, speaking of a brighter film, they could have turned on a few more lights on the Enterprise-D though. ;-) Everything appears unusually dark. Overall, the technical merits of the movie are the best since ST:TMP in my view, despite its comparably low budget. 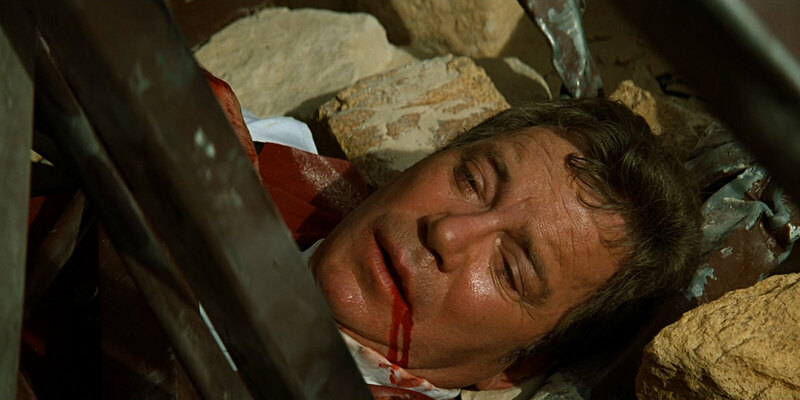 No matter what one might think about Kirk's role and Shatner's performance in the last few movies (which in my view was not always brilliant), he is given a worthy farewell. He puts up a really great fight. This doesn't apply to the Enterprise-D. When I first watched "Generations" I was unprepared. One of my friends had told me that there would be a saucer separation and that I should wait and see. I was appalled that the ship whose voyages I have been intently following for seven years was trashed like that. Starfleet's pride fell victim to an obsolete Bird-of-Prey like already the original Enterprise before. The Klingons in "Generations" are very pre-TNG-like again anyway as if TNG didn't exist or as if this was a 23rd century movie, even if we take into account that Lursa and B'etor are renegades in the view of the Empire. When the distress call from the Lakul arrives, three light years away from the Enterprise-B that is still well inside the Sol system, the Ops officer reports, "We're the only one in range, sir." So the Enterprise is the only starship within a few light-years from Earth, the political center of the Federation with the presumably highest traffic density? The planet is more or less defenseless? Oh well, it's not the first time. When Harriman is at the turbolift door, ready to modify the deflector relays, Kirk changes his mind and calls him back. Does the old man (sorry Mr. Shatner!) think he can take the various ladders and narrow corridors down to deck 15 section 21-alpha of a ship he is barely familiar with and that is frequently pounded by the energy ribbon as fast as Harriman could? Does he have the knowledge to perform the complicated task at all? Kirk probably never bothered to learn details about the Excelsior class, much less about the deflector on the Enterprise-B, which is unlike that of the standard Excelsior. Of course, I won't forget the most prominent error of the movie. Kirk is believed dead before Scotty leaves for the Norpin colony, but when he Scotty is revived in TNG: "Relics" the good engineer thinks that the captain has come for his rescue. Not a hard error really, because who wouldn't be confused after over 70 years in a transporter? Trilithium. Riker is not familiar at all with this "experimental Romulan compound" as Worf calls it. But in TNG: "Starship Mine" trilithium was a well-known by-product of the Enterprise's warp drive. The Nexus always looks like a thin ribbon from a distance. It must travel at high warp if it traverses the whole galaxy in 39.1 years. But when the Enterprise-B encounters the phenomenon, it seems to stand still for about 20 minutes. And even if it drags along the ships that are inside, it once again takes some time for the Nexus to pass the Veridian system. It is even possible to see it coming in the sky. The most obvious logical flaw of the movie has been pointed out many times before. It was mentioned that the probe would take 11 seconds from the launch to the impact in the Veridian sun. In the actual scene this amounts to exactly 13 seconds. So the probe quite obviously travels at warp. But how can we see the light flash from the exploding star immediately after the impact, only to go dark a few seconds later? The light should take a few minutes to Veridian III. So Picard goes back in time, and this time Kirk is with him. But wait. Shouldn't there be a second Picard, the pre-Nexus version? 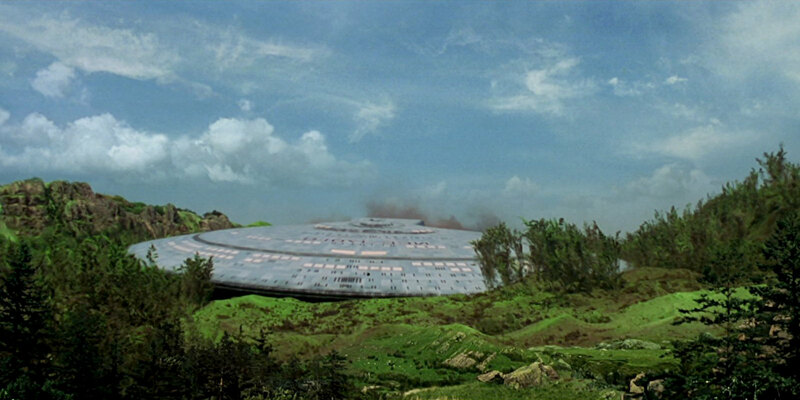 Remarkable scene: The Enterprise-D saucer crash. I was shocked! I was upset! The sacred saucer! A Borg cube heading for Earth is destroyed in a fierce battle with Starfleet, after Picard has pointed out a weak spot in the enemy vessel. The Borg, however, travel back to the year 2063, altering the present in a way that Earth is entirely Borgified. The Enterprise-E follows the Borg to correct history. 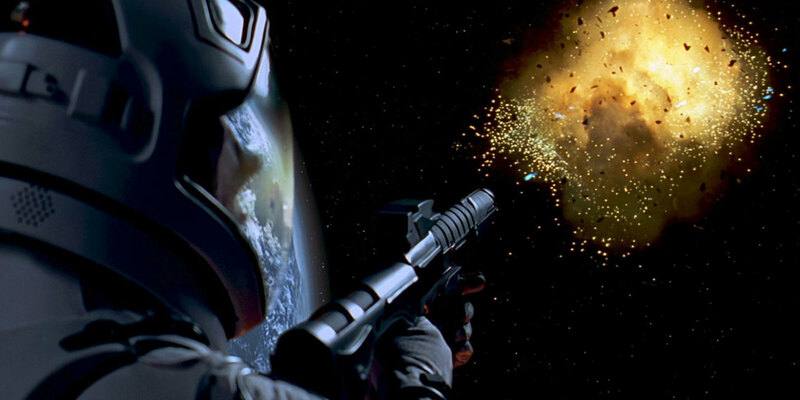 In 2063, the Borg have attacked the launch site of warp pioneer Zefram Cochrane. While an away team is helping Cochrane's people with repairs, the surviving Borg are gradually taking over the Enterprise-E, and Data is kidnapped by them. After a furious dispute with Worf and Lily Sloane, Cochrane's assistant, Picard reluctantly orders the ship's self-destruction. Nevertheless, he still tries to free Data. Data, pretending to work with the Borg Queen who has provided him with human sensations, finally manages to kill the Borg before the ship blows up. The warp flight and humanity's first contact with an alien species takes place as written in the history books when a ship lands near Cochrane's camp, and a Vulcan exits from the hatch. "Star Trek: First Contact" is a thriller. The film manages to establish a somber and menacing atmosphere without abandoning the basic optimism of Star Trek. It was almost a no-brainer to bring the Borg to the big screen - already because their cubes are ideally suited to fill it. :-) Telling the story of Cochrane's first warp flight was a great idea likewise. "Star Trek: First Contact" has an excellent balance between the eye-candy most fans expect in more recent years and the development of the story and of the characters. Since the movie is remembered most of all for its great deal of action, many fans who watch it again after a couple of years are surprised that there are some well-directed calm scenes as well. It is obvious that visual effects as a means to create iconic scenes had been neglected in every Trek movie after the groundbreaking ST:TMP, but here they show up again vehemently, and not to the disadvantage of "First Contact". Already the opening scene with Picard in the Borg cube and the incredibly long zoom-out is astounding, and several more visual tidbits like the first appearance of the Enterprise-E, the Sector 001 Battle, the assembly of the Borg Queen, and the skirmish at the deflector dish will follow. The story focuses on Picard and Data again, but gives the other characters more to do than in "Generations". In particular, the idea to isolate part of the crew in the ship that is being taken over by the Borg and part on the planet to help Cochrane proves successful in this regard. 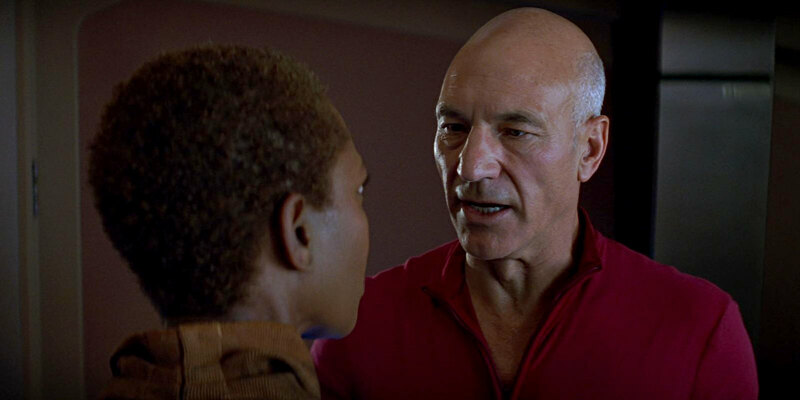 The relationship between Picard and Lily is interesting, since it is not one of the typical (movie) romances. It becomes obvious that the circumstances won't allow them to come together, and so they don't even try. There are only few insignificant points of criticism, concerning some historical inconsistencies and the true nature of the Borg. Personally, I don't like the Vulcan ship either, because it looks anything but Vulcan and its design is much too convoluted to be logical. Time travel in a movie is almost always trouble to explain, but in "First Contact" it is without gross inconsistencies, if we accept that it is possible to restore the future exactly as it was even after damage in the past has already been done. Finally, it is almost needless to mention that the writers and the director did a real quality job, even more so than in "Generations". No doubt: "Star Trek: First Contact" is the best Trek movie. Why would the Borg send just one miserable ship to attack Earth? They already failed once, the main reason being that they underestimated their enemy when they came with just one cube. Would they really repeat that mistake? So Starfleet has no confidence in Picard because he was once assimilated by the Borg and he would be an "unstable element in a critical situation". But if Starfleet had only slight doubts about his loyalty or constancy, would they still let him command a starship at all? 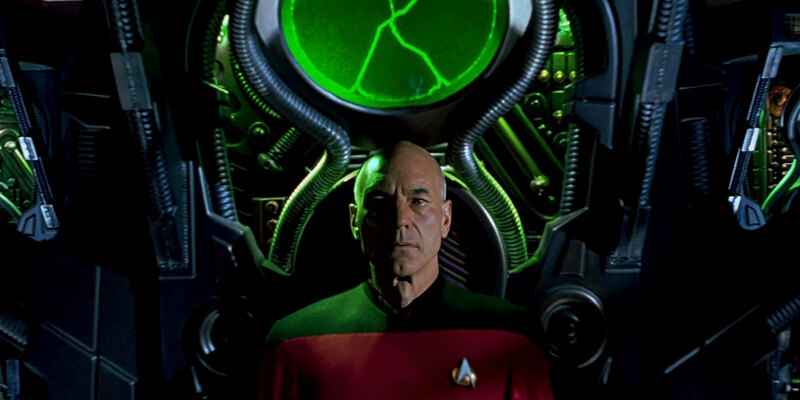 Moreover, on two occasions, in TNG: "I, Borg" and "Descent", Picard already proved that he was able to deal with the Borg, so it makes no sense to keep him out this time. Lily Sloane shoots Data in the back and into the chest. She empties a whole magazine. Regardless of how easily Borg can be killed with projectile weapons, couldn't it be that Data takes severe damage likewise? With so many bullets getting stuck in his body armor, some may come dangerously close to some of his systems. What if she aimed at his head? Would it be so well protected too? Why does he take the risk? Why not try to stun and disarm Lily from a distance? People are standing some 50 meters away from the launch tube of the Phoenix. Realistically they would get roasted - just like the trees, some of which seem to be even closer to the launch site. Remarkable scene: The Sector 001 Battle. Wow! We spent hours analyzing the battle and ruined our copy of the tape. Remarkable ship: the Enterprise-E, a beauty! On a joined Starfleet/Son'a cultural survey mission on the Ba'ku planet, Data suddenly runs out of control and reveals his and his crew's presence to the local population. Picard and Worf succeed in apprehending Data, and they further investigate the case. When they discover a cloaked vessel with a holographic replica of the Ba'ku village, it becomes clear that the plan was to relocate them. The Federation and the Son'a were planning to harvest the rejuvenating metaphasic particles surrounding their planet, which would have made the place uninhabitable. Picard and some of his crew defend the Ba'ku way of living on their planet, while Riker on the Enterprise takes on the Son'a ships. Ru'afo of the Son'a, however, wants to fulfill his mission at any cost, against the will of Starfleet Admiral Dougherty, whom he kills. After trying to beam out the Ba'ku by force, he attempts to use his particle collector without evacuating the planet, which would kill all inhabitants. Ru'afo can be tricked with a simulation of the particle collection and finally dies when Picard blows up his collector ship. A reconciliation takes place after it is revealed that the Son'a are actually the same race as the Ba'ku and left the planet 100 years ago. "Star Trek: Insurrection" is a mainly calm and pleasant movie, and for those who had expected "First Contact, part II" it was probably a disappointment. "Insurrection" is about respect, trust and justice, topics that have made Star Trek the best in science fiction, a quality that arguably ranks even higher than the depiction of futuristic science and technology. The fact that it's not the destiny of the Federation or of the whole galaxy this time, but only of 600 people, doesn't make the whole struggle less relevant. On the contrary, the small Ba'ku planet is like a model, a test of general human(oid) behavior. We have rarely seen Starfleet personnel so committed not only to an obvious goal (like defeating the Borg in "First Contact" or saving the Ba'ku here), but to basic principles of humanity as well as to their own consciousness. Apart from that, the overall beauty of the movie is overwhelming, and this includes the landscape of the Ba'ku planet as well as the emotions of the characters, especially the rejuvenation effects and Picard's and Anij's tender love. There are nice VFX shots, albeit not as exciting as in the inimitable "First Contact" and not always really convincing. The few fight scenes are not misplaced, but necessary for the story, although the cycle of resting and fighting on the planet surface was close to getting boring. Only one thing leaves a bad taste. After Picard has set off the self-destruct of the collector ship, there is not the slightest attempt to save Ru'afo too. A decent hint like "We could beam up only one person" should have clarified that Riker didn't want to let him die. I was a bit disappointed that, unlike what had been announced, the emphasis was completely on Picard. Data's comparably few scenes were too comical or had relatively little relevance. All other main characters were only good for anecdotes like Riker's and Deanna's bathtub scene or Worf's pimple. They were involved better than in "Generations", but I would have expected a bit more than that. I didn't care very much for the Son'a and Admiral Dougherty. Their involvement was limited to playing the bad guys, although they turned out to be not so bad after all. The film was cut down to 90 minutes, and although some of the fight scenes on the planet were too lengthy, a longer film would have been a better film. Concerning the plot logic, I would have expected a more plausible explanation who the Son'a actually are and how these few people who fled from the Ba'ku planet could subdue two other species and build such large starships. On the other hand, I like how Worf begins to explain his unlikely presence on the Enterprise, only to be cut off, which is quite satisfactory because everything else would have been contrived. Cloaked personnel is walking around in the Ba'ku village even before Data runs out of control. I wonder, do they also cloak the sound and the look of their footsteps in some fashion, not to mention the air movement? Geordi says Data didn't take the emotion chip with him. This fact continues a strange development in the movies that will end with Data being totally emotionless again in "Nemesis": In "Generations" the chip is said to have fused with Data's positronic brain, in "First Contact" Data is able to switch it off himself, so how can Data remove the chip altogether prior to "Insurrection", and why should he do it? In the discussion about the Son'a Admiral Dougherty states: "On Earth, petroleum once turned petty thugs into world leaders, warp drive helped to form a bunch of Romulan thugs into an empire. We can handle the Son'a, I'm not worried about them." Picard throws in: "Somebody probably said the same thing about the Romulans a century ago." Although a different, more fitting explanation is possible, it sounds like the Romulans acquired warp propulsion just 100 years ago. When the Enterprise flies by, the collector ship seems to be at least 10km long, as opposed to the design size of barely more than 1km. After Deanna's and Will's wedding, the Enterprise picks up a positronic signal from the planet Kolaren near the Neutral Zone where B-4, a prototype of Data, is found. On Romulus, the new Praetor Shinzon of Reman origin, who has assassinated the Romulan Senate, calls for a Federation ship for negotiations. Shinzon reveals himself as a clone of Picard, once created to infiltrate the Federation, but then exiled to the dilithium mines on Remus. It soon becomes clear that Shinzon used B-4 to lure the Enterprise into a trap. He needs Picard's cells in order to survive and, moreover, he is about to use a thalaron emitter against Earth, by which he would kill all life on the planet. 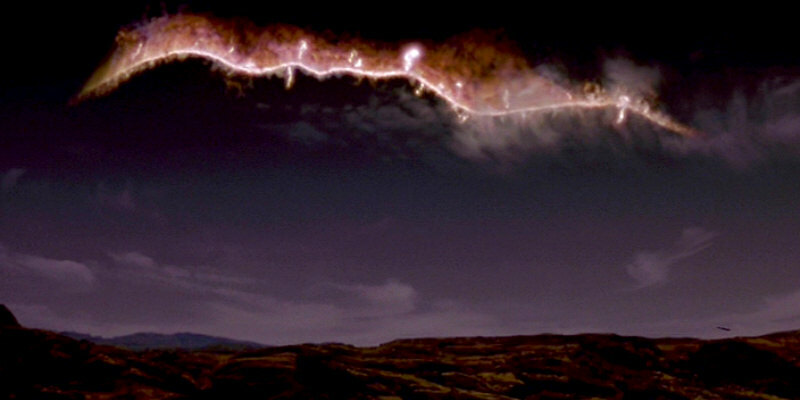 In the battle against Shinzon's superior vessel, the Scimitar, Picard's last chance is to ram the ship and to beam over to blow up the thalaron emitter. Data follows him, and he stays to fulfill this task, dying in the explosion of the Scimitar. The Enterprise undergoes repairs, and Riker leaves together with Troi to take command of the USS Titan, while B-4 shows signs that a previous memory transfer from Data to him was successful. "Nemesis" is an enjoyable movie for the most part, but not much more. The problem I see with its premise is a general problem with Star Trek on the big screen. Most feature films so far had comparably simple plots and they relied heavily on a black/white contrast. With Nemesis, eight of ten movies had a villain whose goal it usually was to destroy the Enterprise, her captain, and/or Earth. The probably better Star Trek, the one on TV, was very seldom about a struggle of good vs. evil. TNG could do almost completely without villains, and DS9 used to exploit the full grayscale of human(oid) behavior not just with the regular cast but even with recurring characters. I wonder why almost every feature film needs to appeal to the lower instincts of the audience by focusing the story on a fight against a villain. Still, the spirit of Star Trek is present in "Nemesis". When Shinzon outlines his motivation in the beginning, tells about his hard childhood and almost fraternizes with Picard, a certain degree of sympathy with the character is created. Unfortunately it is given away very soon that he has no noble goals at all. This is a pity, because it predetermines the way to the showdown. It may have been more intricate if Shinzon had revealed either his true intentions or his appearance later in the movie. Or he could have shown doubts about his doings at one point. At least, he once backs away when Picard urges him to recognize his true nature in their ready room scene. What irks me most about Shinzon is that he needs a mean ship, a pompous leather fetish costume (well, it is at least amusing to hear it squeak at every movement), as well as occasional pathetic statements like "We're a race bred for war. For conquest." that clearly stigmatize him as a fascist. This doesn't suit him, and it would have had a stronger impact, had he been a more decent person just like Picard. But aside from these points, I am content with Shinzon as the antagonist and with the course of the plot - maybe also because screenwriter John Logan based both on "The Wrath of Khan" without rehashing this fan favorite. Something that leaves me vastly disappointed is that the Romulans themselves are hardly conceded a role in the movie. Their empire appears much like a banana republic, considering how easily Shinzon rises to power. There are attempts of rationalizing this (in that coup d'états are said to happen often on Romulus), but seeing and hearing a bit more of the events on Romulus would have been more satisfying. I also miss any familiar Romulan face or anyone else who has dealt with the Romulans before. There is not even a casual line about Sela, Spock's reunification movement or Picard's previous stay on Romulus. In a philosophical dimension, "Nemesis" shows the potential that is in everyone of us. Picard, the son of a wine grower on peaceful Earth, developed in a completely different direction than Shinzon, the lab rat that was exiled to the dark and cruel world of Remus. Shinzon says that Picard would have become just like him, had they switched places. So is there no point in genetic predetermination? Is criminal behavior only a matter of the milieu? Vice versa, would crime vanish in the Federation because this society provides an agreeable life to everyone? It's not as easy as that. I think Shinzon, and to lesser degree Picard too, is depicted as a prisoner of his role. At some point, he unconsciously no longer does what helps him, but what he considers most fitting. 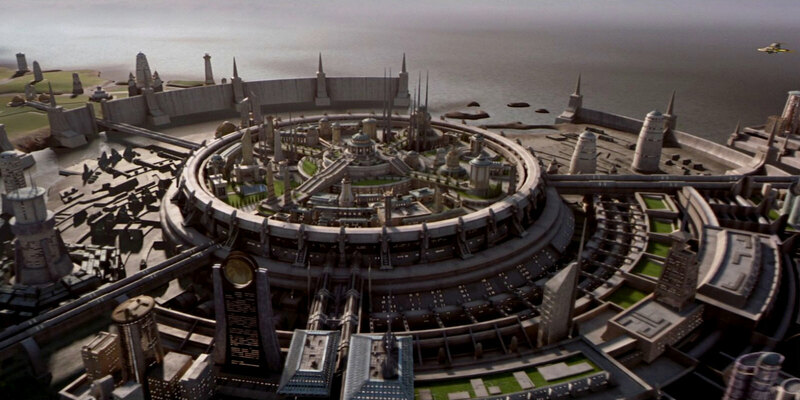 Of course, this is anything but an explanation or even an excuse for what has become of Shinzon. But Picard makes a point when he tells Shinzon that "to be human is to try to make yourself better than you are." This is exactly what Data has been doing in all those years on the Enterprise. One must only permit oneself to be improved. In this respect, ironically the dull machine B-4 seems to be closer to become human than Shinzon ever was. The basic theme of the movie is that Data and Picard each find their doppelganger. I am glad that this does not turn out a coincidence. B-4's appearance belongs to Shinzon's plan. He's a man who is quite fond of the symbolism of his actions. As a side effect besides luring Picard to Romulus, he may want to confront Data with his evil counterpart just as he is Picard's. But once stripped of all modifications, B-4 is just the equivalent of a child. I appreciate that B-4 does not turn out as just another Lore and that Brent Spiner plays B-4 without a sign of silliness. Picard's scenes together with his nemesis are clearly more interesting, however. Tom Hardy is convincing as Shinzon, within the limitations of the somewhat theatrical character I outlined above. Patrick Stewart performs well as always, now in a victim role for much of the time, unsure about his actions because the enemy is somehow he himself. The rest of the main cast is not particularly strongly involved. Only Deanna makes a considerable contribution to the story. Although it begins with one more instance of the "Troi suffers" cliché, I like how her telepathic abilities are eventually fused with the ship's technology to detect the cloaked Scimitar. Riker's scenes fighting with the Reman Viceroy on the crippled Enterprise, on the other hand, are rather expendable. I wonder if they had been better removed in favor of something else, considering that "Nemesis" was cut down by 40 minutes. But Frakes may have asked for more screen presence, and the Viceroy may have been supposed to find an end worthy of a villain. The amount of action sequences is extraordinary this time, maybe even compared to "First Contact". What I definitely like is the longest space battle in Star Trek history. Something that I wouldn't miss is the beach buggy race. Not only that it clearly violates the Prime Directive. Not only that Starfleet shouldn't have wheeled vehicles any longer. Overall, it reminds me too much of "Mad Max" and similar (mostly trashy) end-of-days scenarios. Adolescent and uninspiring. The special effects are quite good and their number unprecedented in Star Trek, but definitely not flawless. Most "cheap" Voyager episodes appear to be on the same qualitative level. On the other hand, we should consider that the small screen may be more forgiving. "Nemesis" has a couple of logical flaws and continuity problems. Most obviously, why is it that we have never seen the Remans? Sure, they are said to be slaves confined to Remus. But with Remans serving in the Romulan fleet, it seems very unlikely that they never showed up before. Coming back to the doppelganger theme, it would have suited the movie a lot better if the Remans had looked exactly like the Romulans (at least to outworlders). It would also have freed "Nemesis" from the cliché that the bad guys must look ugly (I think the indigenous aliens on Kolaren were enough ugliness for this time, Mr. Westmore). If the Remans had been outwardly equal just like B-4/Data and Picard/Shinzon, this conflict could have become just the mystery it should better remain. A bit like with Bele and Lokai in TOS: "Let That Be Your Last Battlefield". "Nemesis" is the first Star Trek movie without opening credits. This was obviously supposed to shorten the film even more. Personally, I would have preferred to be slowly introduced into the story (like in "Insurrection"), but I admit the opening scene with the zoom on Romulus is nicely done. Something that troubles me more is Goldsmith's score. I hardly even noticed it in the theater (which may be even a good sign), but what I remember is something harsh and military along the lines of "Star Trek VI", only unremarkable. There are some brief moments with the "First Contact" theme, but this is even more a sign that the score lacked anything unique. Concerning the reception of "Nemesis" in a broader public, I agree with some points of other critics, but I don't share their assessment of it as a Star Trek movie. They almost unanimously think that the whole franchise is exhausted and that we have seen everything before. I could say quite the same of their reviews. But honestly, shouldn't they rather complain about a general trend especially in the sci-fi/action/disaster/horror genres? Truth to be told, most of the recent flicks in this field (and especially those numbered >1) suffer from unremarkable stories, corny dialogues and ridiculously exaggerated stunts. We may take them either as meaningless entertainment or as unintentional satire. One thing that will always distinguish Star Trek from such action mass products is that here is an overall serious tone, stories about characters and an attempt to make a point beyond the mere entertainment. "Nemesis" may be only average Star Trek, it may be only average from a purely cineastic viewpoint, but is still light years ahead of the crowd. We may accept that Janeway was promoted to admiral ahead of Picard and despite her several failings. But how is it that she has three pips on the collar? She is not a rear admiral lower half (or commodore, one pip), not a rear admiral upper half (two pips), but even a vice admiral, three ranks higher than Picard. With Voyager arriving in 2377 and "Nemesis" taking place in 2379 Janeway would have achieved that in no more than two years! "I feel nothing, Geordi." Huh? 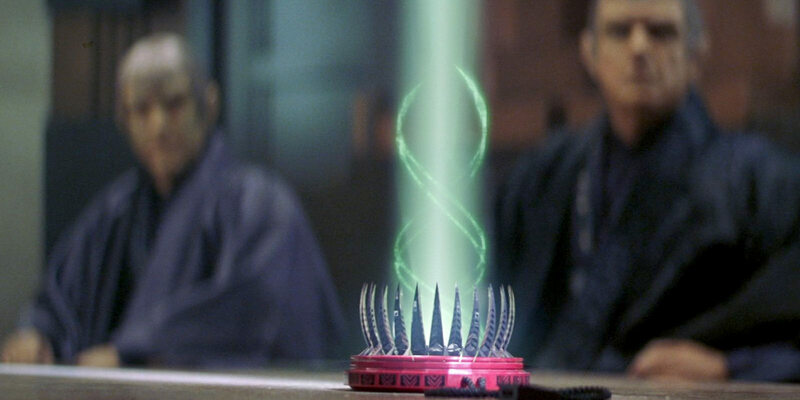 In "Insurrection", it was at least mentioned in throw-away notes that the emotion chip could be removed. But here Data seems to be the emotionless TV series Data most of the time. Thalaron radiation is said to destroy organic matter on a sub-atomic level. This is scientific crap because everything that makes up organic compounds takes place on the molecular level. The quarks certainly don't know if they belong to the cells of a living being or to a solid rock. When Picard comes up with the desperate(?) idea to ram the Scimitar, we can see everything on the bridge in real time. But no one bothers to issue a warning to the crew members who may be in the front of the saucer section. Most likely Picard is killing Guinan! Why is Picard going to the Scimitar alone? This is just stupid. The Scimitar has to be defeated at all cost, and Picard is acting like a complete fool just because he thinks he has a special business with Shinzon. 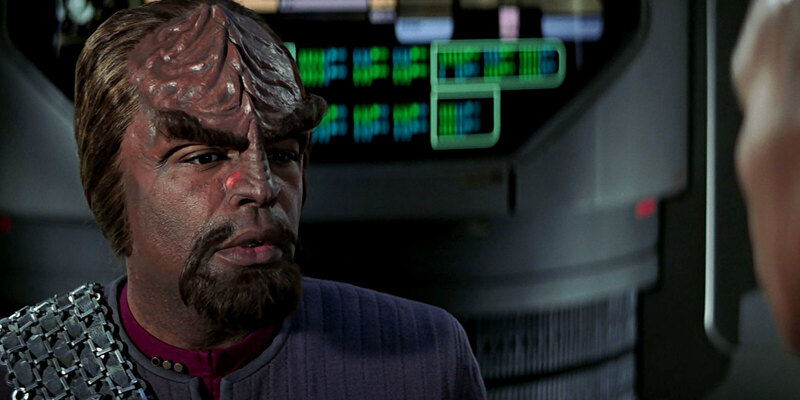 Worf or anyone else should have insisted on following him with a heavily armed away team in a shuttle.